The first critically endangered spoon-billed sandpiper to hatch in captivity in the world was always going to be a spectacular sight, but when a Heritage Expeditions boat docked in Anadyr last night not one, not two, but an incredible 17 tiny, hatched spoon-billed sandpiper chicks emerged. The incredibly ambitious mission to collect eggs from the rapidly dwindling number of nests on the breeding grounds in Chukotka and transport them thousands of miles via land, sea and air to the conservation breeding facility at WWT Slimbridge hatching has reached an important milestone. Things have gone as well as could possibly have been hoped for so far, but saving this species is still going to be an uphill battle. A couple of the hatchlings aren’t quite as strong as the others and we will have to accept that we will lose some. 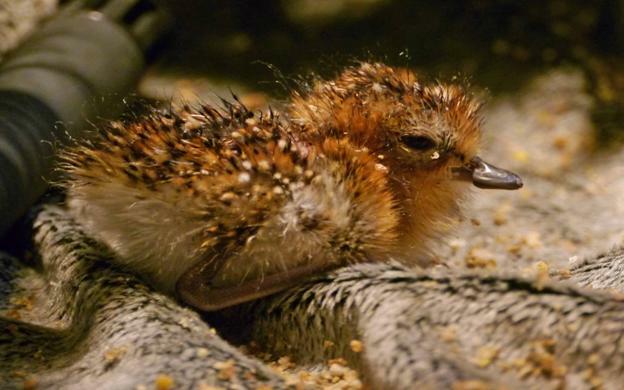 The survival rate for spoon-billed sandpiper chicks in the wild is extremely low. On average just four chicks fledge out of around 20 eggs laid and only one of these would survive to recruit into the adult population two years later. Taking these newly hatched chicks from hatching to fledging will be enough of a challenge on its own. However, even this is dwarfed by the work that we and our partners need to do to tackle the threats to the species in the wild (see Editor’s Notes). The conservation breeding expedition, led by staff from the Wildfowl & Wetlands Trust (WWT) and Birds Russia, has support from the RSPB, BTO, BirdLife International, ArcCona, the Spoon-billed Sandpiper Task Force and Moscow Zoo. The project is funded by WWT and RSPB, with additional financial contributions and support from BirdLife International, the East-Asian Australasian Flyway Partnership, the Convention on Migratory Species, Heritage Expeditions and the Australasian Wader Study Group of Birds Australia. For more information contact the WWT press office on 01453 891138 /176 /138 /144/205, mobile 07920 810491, or email prteam@wwt.org.uk. The Spoon-billed Sandpiper is a unique and remarkable bird, but its shocking drop in numbers indicates likely extinction within a decade if urgent action is not taken. Research suggests that the breeding population of spoon-billed sandpiper was between 120-200 pairs in 2009, with the species believed to be declining at approximately 26% per year, due to extremely low survival of juvenile birds. If this trend continues, the spoon-billed sandpiper could be extinct within a decade. The chicks will spend the next few weeks at a temporary facility in Anadyr. When the youngest is at fledging age, they will be flown to Moscow Zoo for quarantine. Later this year, the chicks will then be transferred to a specially built conservation breeding unit at WWT’s headquarters in Slimbridge, Gloucestershire. The team plans to establish a population in a conservation breeding facility at WWT Slimbridge which will be the source for reintroductions over the coming decades, once the threats to the birds and their habitats along their flyway have been sufficiently addressed. Dealing with the threats to the bird on the flyway will help a range of other species destined to suffer a similar fate. The conservation breeding expedition, led by staff from the Wildfowl & Wetlands Trust (WWT) and Birds Russia, has support from the RSPB, BTO, BirdLife International, ArcCona, the Spoon-billed Sandpiper Task Force and Moscow Zoo. This project is funded by WWT and RSPB, with additional financial contributions and support from BirdLife International, the East-Asian Australasian Flyway Partnership, the Convention on Migratory Species, Heritage Expeditions and Birds Australia. The spoon-billed sandpiper was first listed as Critically Endangered in 2008 by BirdLife International on behalf of the IUCN. In recent years the dramatic speed of decline has been realised, and thus the need for emergency action, without which the species stands a high risk of extinction. There are currently none in captivity, so there is no safety net against extinction in the wild. The bird’s migratory flyway takes it 8,000 km along the East Asian-Australasian flyway each year from Russia to the Bay of Martaban, Myanmar and the Bay of Bengal in Bangladesh. On that journey and during winter they have been reported from Japan, North Korea, the Republic of Korea, China, Vietnam, Thailand, Myanmar, Bangladesh and India. It is believed that the main reason for the long term decline in this species is destruction of intertidal habitat on the vital stopover area of the Yellow Sea. The loss of this refuelling area is likely to have disastrous consequences for the species' migration. Unsustainable levels of subsistence hunting, particularly on the wintering areas in Myanmar and Bangladesh, seem to be causing incredibly low survival among juveniles. It appears that very few young birds are recruiting into the breeding population, while the existing breeding pairs are ageing: this is a recipe for future extinction.